The most passionately discussed New York City gallery exhibition of last season might have been Philip Guston at Hauser & Wirth, but the most talked-about one by a living artist was undoubtedly “David Hammons: Five Decades” at Mnuchin Gallery. Each of the two shows cast its own spell, one very different from the other, but both seemed to offer one emphatic if understated lesson to young artists: Keep your distance from the art world. Guston sought solitude by “painting a lot of other people out of the canvas,” as Harold Rosenberg put it in a conversation with him. Guston concurred: “People represent ideas…. But you have to paint them out. You know, ‘Get out.’” He told Morton Feldman that “by art I don’t mean the art world, I don’t mean lovers of art.” Lovers of art—people like me—might love it to death; what we love in art may not be what the artist needs from it. Guston once compared the art world to a country occupied by a foreign power. Hammons is even more vehement. For him, not just the art world but art itself is suspect. “I can’t stand art actually. I’ve never, ever liked art,” he told the art historian and curator Kellie Jones in a 1986 interview that remains the most complete exposition we have of this notoriously unforthcoming artist’s philosophy. Claiming to have finally become “too old to run away from this gift,” and fascinated by the “outrageously magical things” that sometimes come of it, Hammons gave in, but without surrendering his reservations. Art should catch you unawares, he told Jones, preferably anywhere but in a gallery: “I like doing stuff better on the street, because the art becomes just one of the objects that’s in the path of your everyday existence. It’s what you move through, and it doesn’t have any seniority over anything else.” In a legendary 1983 performance, Hammons set up a sidewalk vendor’s space on Cooper Square, peddling snowballs that he arranged by size and priced accordingly. Such haughtiness might seem risky to artists coming of age in the social-media era, where accommodation and availability are the minimal conditions for success. Or possibly not, since it’s Guston’s and Hammons’s refusal to assimilate—­and, of course, the eye-opening art that it made possible—that continues to inspire. But who gets to be inspired? Hammons has complained that “the art audience is the worst audience in the world. It’s overly educated, it’s conservative, it’s out to criticize not to understand, and it never has any fun. Why should I spend my time playing to that audience?” The paradox is that, at least for Hammons, dissing the art world turned out to be the best way of winning it over, and his art is no longer a denizen of the street but of the toniest galleries. When Hammons bites the hand that feeds him—and it feeds him very well; he’s one of the top 10 living American artists by auction price, and the piece that scored this record was auctioned not by a collector, but by the artist himself—the response is usually a swoon of pleasure. His first show with L&M Arts, Mnuchin Gallery’s predecessor, in 2007 featured fur coats despoiled with swaths of paint; it didn’t look like much to me, but lots of people waxed lyrical over the sublime nerve of scandalizing the posh uptown crowd by trashing their most precious apparel. No matter that there are always more minks to ranch and foxes to hunt, or that these coats had become even pricier with the swipe of a brush. That’s what counts uptown (and in most other places), isn’t it? So the joke was on whom exactly? If that 2007 show was a one-liner, Hammons’s second show at what was still L&M, in 2011, was anything but. The artist had never been known as a painter—though I suppose his treatment of the fur coats could be seen, in retrospect, as an unorthodox example of that genre—but this was a painting show unlike any other. The works were big, bold, and brushy in a manner reminiscent of Abstract Expressionism—­or, I should say, so they seemed from what little one could glimpse of them, because they were mostly covered by torn black tarpaulins, plastic garbage bags, and the like. Was this a cruel joke on the market’s preference for painting? Some observers thought so, though given Hammons’s long-standing association with outstanding painters like Ed Clark and Stanley Whitney, that hardly seems likely. In fact, the hybrid three-dimensional constructions that he’d eked out of the dubious amalgamation of relatively traditional artistic means and grubby everyday stuff were nothing short of magnificent. Significantly, Hammons insisted that L&M break with convention by issuing no press release, but the works themselves spoke eloquently enough about how an artist need neither to renounce nor adhere to any aspect of his tradition (including the by-now-traditional rejection of tradition) in order for “outrageously magical things” to happen. With Hammons, they do, more often than not. Delving even further back into Hammons’s exhibition history gives an even stronger sense of his unpredictability. At a 2002 show at the Ace Gallery in New York, “Concerto in Black and Blue,” the rooms were unlit, shrouded in darkness; visitors were given small blue flashlights so they could make their way through galleries empty of everything but whoever else was passing through. Roberta Smith elo­quently described the experience as “like being surrounded by Arctic fireflies or walking among faintly visible ghosts.” Given that Hammons is such a spectral presence himself, how can his multifarious oeuvre be summed up in a single retrospective survey? What could it mean to look back on five decades of work by someone convinced that being an artist means (as Hammons told Jones) “never liking anything he finds, in a total rage with everything, never settling or sacrificing for anything”? At Mnuchin last spring, it meant, for one thing, last-minute changes to “Five Decades”—­and more changes made during the course of the show—that were much talked about in the art world. Apparently, Hammons decided as he was hanging the show to exclude some of the works that had already been loaned by important collectors—­an affront in itself—and substitute some small, cheaply framed photographic pieces, many of them documenting some of the more ephemeral works he’s done over the years. Is Hammons contrary for the hell of it? It would certainly jibe with his proclaimed admiration, as a younger man, for artists who “were like poets, you know, hated everything walking, mad, evil; wouldn’t talk to people because they didn’t like the way they looked. Outrageously rude to anybody, they didn’t care how much money that person had.” It’s a lot easier to talk that talk when, despite all expectation, you’ve ended up with more money yourself than you probably ever imagined. But still, that attitude is justified only by the art it makes possible and, so to speak, defends. Making bad art to spite an art world primed to accept your every whim as a sign of genius would be the ultimate self-defeating gesture. It’s strange that some of Hammons’s admirers think this is his modus operandi. There’s no doubt that the great impression left by “Five Decades” came from some of the show-stopping, indelibly strange, sometimes haunting sculptures Hammons has made over the years. I’m thinking of pieces like the 13-and-a-half-foot-high Basketball Chandelier (1997), a pole leaning against a wall and topped with a hollowed-out backboard and rim, the basket itself made of crystal prisms; or the eerily simple In the Hood (1993), a hoodie’s excised hood mounted on the wall and held open by a wire rim, emptily gaping from on high. There are also the recent untitled works—taking off from the paintings of a few years back, a couple of which were also on view—made of big old mirrors draped with torn fabric or blocked with sheets of galvanized steel. These are strangely figurative works: The mirrors become bodies clothed in outlandish, maybe mournful garb, at once scavenged and ceremonial. That the young athletes’ whiteness seemed so striking in this context probably means I have to use a word I’ve been consciously trying to avoid using. But while Georges Perec managed to write hundreds of pages without using the letter “e”—he failed if you consider his name on the title page of La disparition (in English, A Void) as part of the novel—I’m not virtuoso enough to write a couple of thousand words on Hammons without talking about blackness. That’s unsurprising, considering how deeply race informs his approach, his subject matter, and even his materials (an untitled sculpture from 2004 is a gray stone turned into a kind of portrait head by being topped with hair gathered from a Harlem barbershop). But my reticence, I hope, is just as understandable, because one thing Hammons makes me feel is how much of an outsider I am to his world. That’s not accidental: “White viewers have to look at someone else’s culture in those pieces and see very little of themselves in it,” he told Jones. “And that’s the beauty of looking at art from other cultures, that they’re not mirror reflections.” Is that why he later decided to work with shrouded mirrors? If I’m honest with myself, maybe part of the reason I didn’t write about “Five Decades” back when it was on view was that it made me self-conscious about how race and culture condition interpretation. I didn’t feel ready to think through my reactions to the work. And the last thing I wanted was to let myself off the hook by just joining the chorus of praise for Hammons, as if that might make me right with the Lord. What’s more demeaning than joining the laughter at a joke that might be on you? Luckily, I’ve had another, unexpected chance to delve into Hammons’s art. In Greece this summer, there was a scarcely publicized show of his work on view (through September 30) at the George Economou Collection, a private museum in Marousi, a northern suburb of Athens. (Its owner is a Greek shipping magnate, not the American poet who happens to have the same name.) 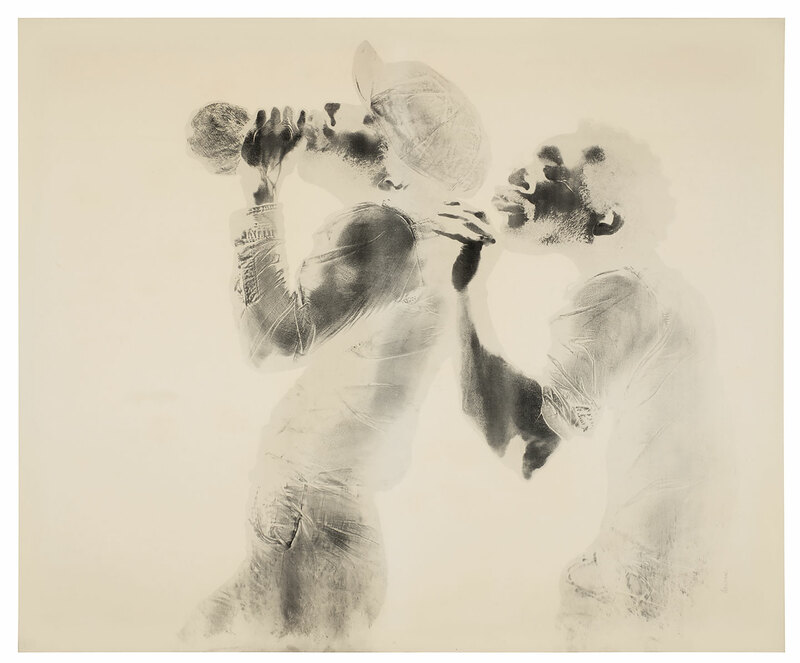 “David Hammons: Give Me a Moment” is billed as the artist’s first European survey, although it’s a smaller show than “Five Decades”; it even includes a couple of the same or very similar pieces. Ably overseen by Mark Godfrey, a senior curator at the Tate Modern in London, the show’s tighter focus makes it stronger than the one in New York. But whether it’s because of Godfrey’s selection or simply because I was looking at the work in a different context—one in which the specifically American history of racial oppression slips from foreground to background—I saw Hammons’s work differently. Not that race disappears as a subject. Recalling the 2002 show at Ace Gallery, which was his first encounter with the artist’s work, Godfrey observes: “Readings that try to force Concerto to be a symbol of African American experience are reductive, but to ignore the metaphorical or cultural resonances of darkness, black, and blue would be equally wrong.” In Athens, though, Hammons’s work seemed blessedly indifferent to such dichotomies. Although as sly as ever, it made the artist appear less of a trickster; the characteristic anger of his work was still discernible, but it suddenly seemed less important than the love embodied in it. The overwhelming tenderness in his handling of material corresponds to his feeling about the people whom his art is finally about: black people, in the main, but not only. One of the most touching pieces, inspired by his stay at the American Academy in Rome, is called Roman Homeless (1990). Nothing more than a piece of worn-out, nearly colorless embroidered fabric draped around a cylinder of metal mesh that might or might not be a trash basket, and with some discolored old tennis balls and bits of crystal from a chandelier hanging from one side, the piece is an unforgettable portrait of someone to whom you might give a coin in passing without really noticing—but who, on second thought, could just as well be the soothsayer in Julius Caesar foretelling your Ides of March. There’s something minatory about this eerily faceless head decked out in poverty but also in great ceremony—and yet there’s also the implication that if you had the heart to break the boundary of difference and at last simply see this person face-to-face, the threatening spell might dissipate. Hammons keeps reminding us that seeing each other is not so easy. At the Economou Collection, there was an untitled work from 1996 consisting of a sequence of African masks—cheap knockoffs, not museum pieces—placed atop one another, bound together with wire and cord: masks masking masks masking other masks, and behind them a blank wall. And just in case you think you can see through them to the underlying reality, at the front of the pile, there’s a little mirror.